So, last week I brought you the original version of the Blinker, or something close to it, and I mentioned that famed cocktail historian Ted Haigh had unearthed this drink. Despite being a true revivalist, Haigh felt the drink needed an improvement, if not an actual update. For starters, while the original version appears to have called for either bourbon or rye. (I limited myself to bourbon last week.) Haigh’s version is strictly rye. The original also had grenadine as its sweetener. Haigh’s version, which he has since christened “Dr. 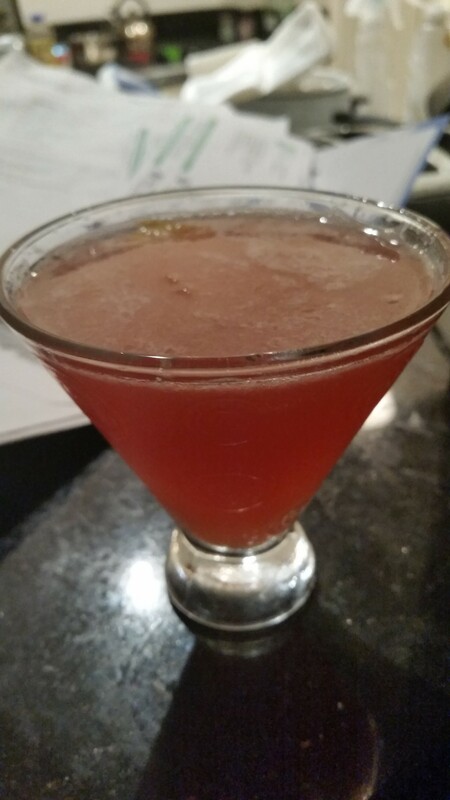 Cocktail’s Blinker,” contained not just raspberry syrup, but a very particular species of it. This is the stuff that tastes rather like jam, only without any trace of actual fruit, and which some people pour over ice cream. 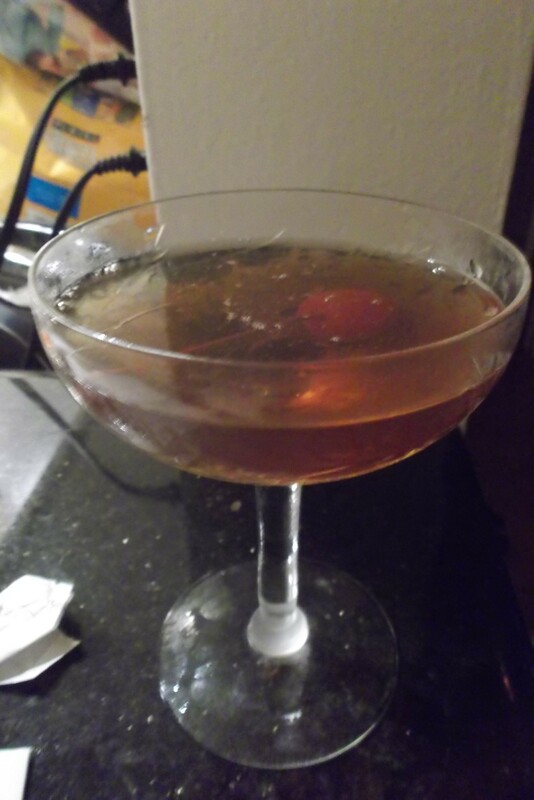 Apparently, it was an old school substitute for grenadine, and it certainly sounded like it was worth a try. No surprises in terms of preparation. Combine the rye, juice, and syrup in cocktail shaker. You might want to stir it a bit before adding the ice to make sure the syrup dissolves, especially if it’s been kept in the refrigerator. Then add about a ton of ice and, well, you know the rest. Shake vigorously and strain into a chilled cocktail glass, throw in the lemon twist. Toast Dr. Cocktail/Ted Haigh, if only because he is the creator of by far the most popular modern day version of the Blinker. All in all, I have to agree with Ted Haigh that his tweaked version of the Blinker is superior. Rye is just a hair less sweet than bourbon and noticeably more peppery, and it makes a bracing contrast with the bittersweet grapefruit juice and the just-plain sweet raspberry syrup. For the sake of experimentation, I tried the Dr. Cocktail Blinker drink with bourbon, and it was a no go. Not awful, just not so good. My ryes produced nice but highly varying results. I used Old Overholt (Haigh’s preference), Rittenhouse (my 100 proof default rye), and slightly more upscale/moderne Redemption rye. Even more interesting is his choice of the jam-like raspberry syrup over grenadine. I used Smucker’s brand because it was the only choice the supermarket I happened to be in had, and it was fine. It’s a simpler kind of sweetness than a decent grenadine, and I think it really does make a better choice in a drink that’s already buzzing with the contrasting flavors of rye and grapefruit. 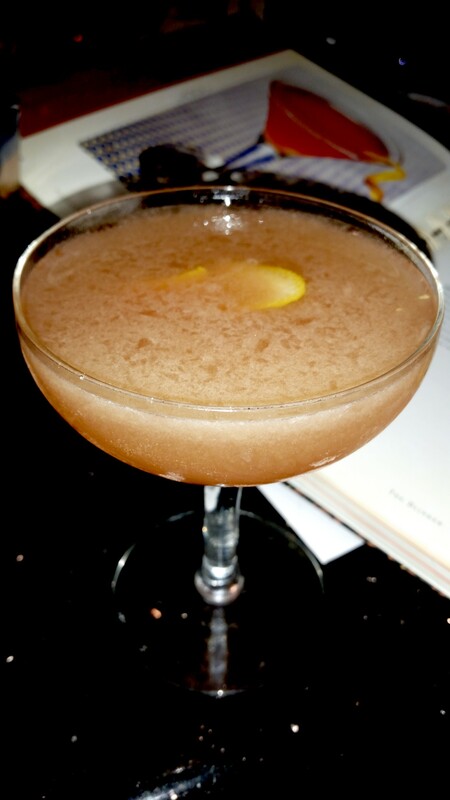 The Blinker was one of the many moribund beverages revived by Ted Haigh in his epochal 2009 book, Vintage Spirits and Forgotten Cocktails. Haigh, in turn, found the drink in a 1934 tome by a Patrick Gavin Duffy but found it “unremarkable” and he therefore messed with it. We’ll try Haigh’s messed with version later, but we start with the unvarnished original. The Duffy Blinker might not have knocked my socks clean off, but it really is a very nice drink enlivened by a generous portion of fresh grapefruit juice. I have to admit that the fact that I still had some extra-large citrus around after last week’s drink was my primary motivator for choosing the Blinker. I never used to like anything grapefruit but, by god, the bittersweet fruit is really growing on me. It’s certainly tasty enough in this beverage. Combine your liquids in a cocktail shaker with an excess of ice. Shake most vigorously, and strain into a chilled cocktail glass. Add your lemon twist if you’ve got one handy. As for the toast, let’s mix things up and salute, heck, Ethel Barrymore. I just saw her for the first time in 1948’s “Portrait of Jennie” (ask your neighborhood movie geek/film buff, or your great-grandmother) and she was extremely good in it. As a Barrymore, I’d like to think she might have tried a Blinker. This drink worked very nicely with the two different bourbons I had time to try before I was briefly sidelined by a small cold. (As I write this, I’ve been dry for a shocking four days!) Wathen’s Kentucky Bourbon made a fine, sweet base spirit, but there was more 100 proof, bottled in bond, punch when I killed my bottle of good ol’ Old Fitzgerald’s (my favorite bourbon bargain up to now). I will also add that I suspect it’s probably very important to use a decent grenadine in the Blinker. Ted Haigh, you see, felt the need to make a substitution for this ingredient. He might have been partly moved by the fact that so many commercially available grenadines are hard to distinguish from any other high fructose corn syrup based concoctions. At the same time, while it’s great to spend extra dough and go gourmet, or go crazy and make your own grenadine, as some bloggers insist, there is another option. Take a little time and find a reasonably priced product that includes a little real juice, pomegranate most importantly. Master of Mixes grenadine includes pomegranite and cherry juice; it has served me well for some time and it only costs a few bucks…and, no, they haven’t been sending me free bottles in the mail. Not yet, anyway. Bourbon keeps growing in popularity, and we love trying the premium brands. The good folks at Basil Hayden’s Bourbon were kind enough to send us a bottle, and we definitely enjoyed trying it straight and one the rocks. The first thing we noticed was the stylish bottle that tells the history of Basil Hayden, Sr. distilling the first bottle of his bourbon way back in 1796! It has a memorable, spicy flavor that you can savor. If you’re looking for a small-batch bourbon to add to your home bar, you’ll want to try this one out. 1. 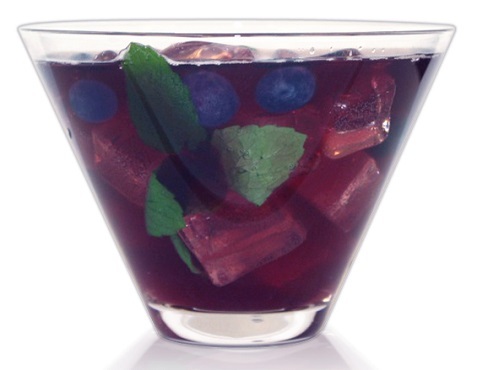 Add Basil Hayden’s, blueberry juice, passion fruit juice and ice in a cocktail shaker and shake. Freeze one bag of frozen blueberries with water in a bunt cake pan. Dip frozen ring into hot water for a few seconds to unmold. Place in punch bowl with blueberry side up. Lately, we’ve been featuring a few cocktails made with really good booze sent to me by the dark forces of the liquor-industrial complex. Today’s post is a bit different as the much appreciated gift of free booze came not from some shadowy Sidney Falco, but from Ron Shishido, a very old junior high/college buddy who’s probably taught me how to appreciate a good booze concoction as much as anyone else on this planet, including Rachel Maddow. Amaro Montenegro is, on it’s own and served neat, quite a lovely drink. It’s a member of the amaro family of bittersweet liqueurs which occasionally pop up in cocktails. It’s popular enough in Italy to be featured in a series of slick commercials of the kind we use to sell highish-end beer in the States, and that’s for a reason. With a hard-to-pin down but relatively fruity flavor, it’s a kinder, gentler, vastly more drinkable brew than, say Torani Amer or the superior — but still two-fisted — Amaro CioCara. As bitter digestifs go, this one’s pretty sweet. Perhaps because it’s so readily drinkable all on its own, I had a hard time finding a cocktail made with this particular amaro. However, Food and Wine bloggers Carey Jones and John McCarthy came to the rescue with a few recipes. I chose one featuring my all-time favorite non-alcoholic cocktail ingredient, egg white. I’m not sure the drink is so accurately named, however. Whatever alleged citrus flavor there is comes from the mysterious herbal blend from which Amaro Montenegro is made, so it’s really more bitter, in a good way, than sour. On the plus side, that means no potentially messy juice squeezing is required this time around and that definitely speeds up the cocktailing process. That’s good because I’m breaking my usual rule against recipes requiring home-made syrups. Yes, there’s a tiny bit of extra work involved, but be bold and read on. 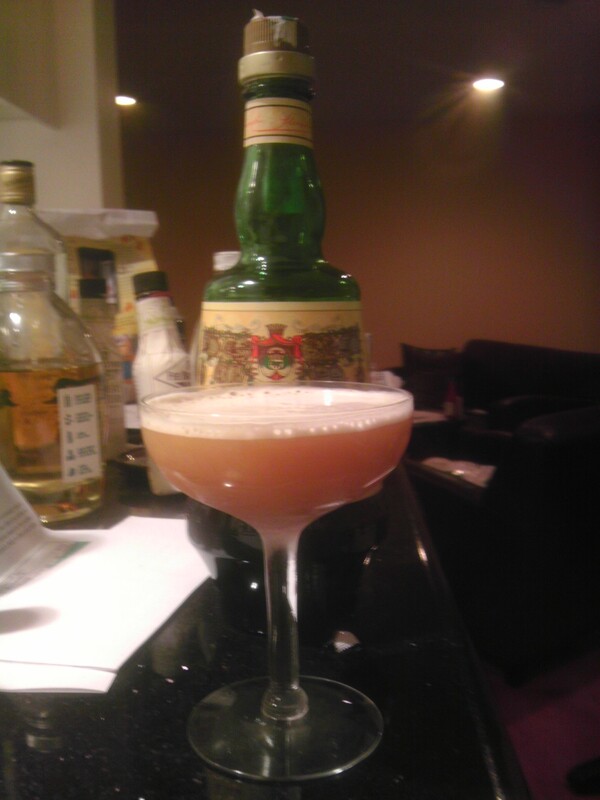 Combine the Amaro Montenegro, bourbon, syrup, and bitters in cocktail shaker. First, as always with egg or egg white cocktails, we do a “dry” shake without ice to emulsify it. Then, we shake again, very vigorously and with plenty of ice, and strain it into a chilled cocktail glass or smallish rocks glass. We then enjoy this delightfully refreshing beverage and toast our amaro’s namesake, Princess Elena of Montenegro, the World War II-era queen consort of Italy known, for the most part anyway, for her good works. Despite the fact that I often tell publicists with recipes that make-it-yourself syrups are off the table, I decided to make an exception this week for a couple of reasons. First. the honey syrup for this recipe is ridiculously easy to make. Just mix equal parts honey and hot water, then stir. I put 1/4 cup of honey and that much water in the microwave for 30 seconds, stirred the stuff, and then put it in the freezer for a few minutes so it wouldn’t be too hot. Low on both muss and fuss. The second reason we’re using the honey syrup is that I actually tried this drink more than once with my usual Master of Mixes Simple Syrup and it just didn’t do the trick. Too simple. Apparently, you need that little bit of honey flavor to complement the bourbon and amaro. I used three different brands of bourbon. The always outstanding 80 proof Basel Hayden’s yielded a nectary result that went down very easy indeed. 94 proof Wathen’s, a brand that’s I recently bought out of curiosity and which I’m quite liking, produced a boozier, but also more full bodied, result. Finally, there was the version using an old DOTW favorite that’s been returning to my local stores of late, “bottled in bond” 100 proof Old Fitzgerald, which remains the best bourbon bargain I’ve found at, in my case, less than $15.00 for a bottle. It produced a sweet, tangy, and very punchy attitude adjuster that, at that particular moment, was very much what the doctor ordered. Admittedly, however, that doctor would not be a liver specialist. Finally, I have to add a few more words on the enormous power of egg whites to really transform a drink. Contrary to the common assumption, whites in drinks are not even slightly slimy but add a smooth, almost milky, froth to a drink. The froth smooths over the rough edges of the other flavors and unites them as well as anything I’ve ever experienced. I just crack open a large egg and maybe wash the shell first. However, people with real health concerns of any kind about this should very definitely consider using about 1-1.5 ounces of one of the many brands of pasteurized egg white on the market.